Herbal medicine is one of the oldest healing tools with evidence showing it was used as far back as 3000 B.C. This is not surprising when one considers that all our ancestors had came from the Earth. Much of the world still uses plants as their primary medicine. In addition, many major pharmaceuticals are still derived from plants and herbs. However, most herbalists recommend using the entire herb, whereas pharmaceuticals use extracted plant constituents. Although it is well-known that plants can have hundreds of biologically active compounds, some believe that because each of those compounds have different effects, that isolating them is the most efficient way to get results. Others believe that the whole herb is essential to provide the balance that nature intended, as is a concept popular in Ayurveda. According to Merriam-Webster Dictionary an herb is “a plant or plant part valued for its medicinal, savory, or aromatic qualities,” while a spice is “any of various aromatic vegetable products (as pepper or nutmeg) used to season or flavor foods.” Spices are generally dried herbs. 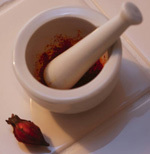 Adding spices to meals is an easy way to add nutritional benefits. Herbs are widely-used in Naturopathy, Ayurveda, Chinese Medicine, and Homeopathy. The American Herbalist Guild represents herbalists in the U.S., but licensure and regulation are not firmly set or recognized unlike other countries like England or Germany. To find an herbalist, visit www.americanherbalistsguild.com/fundamentals and select your state from the drop-down list on the top left. American Botanical Council (ABC) – http://abc.herbalgram.org – a source for education on herbs including the journal HerbalGram. American Herbalist Guild – www.americanherbalistsguild.com – a source for finding reputable herbalists, along with education and resources. Botanical Dietary Supplements – http://ods.od.nih.gov/factsheets/BotanicalBackground-HealthProfessional/ – information from the Office of Dietary Supplements of the NIH that details important information on herbal supplements. “Botanicals around the Home” – www.crnusa.org/botanicals/kitchen-facts.html – An article from the Council for Responsible Nutrition that reviews10 of the most popular spices and their health benefits. Herb Research Foundation – www.herbs.org -a nonprofit organization dedicated to providing science-based information on medicinal plants. Info Herb – www.infoherb.com – a site from Medical Herbalist Jaime De La Barrera. There are detailed charts of herbal uses based on the Materia Medica. Numen – http://numenfilm.com – a beautiful documentary on the healing power of plants. The site also includes excellent resources on herbs including how to make your own medicine. Sagemountain – Rosemary Gladstar – www.sagemountain.com – the site and retreat center of herbalist, author and educator, Rosemary Gladstar. Susun Weed –www.susunweed.com/ – Susun is a popular herbalist and founder of the Wise Woman Center an educational center on natural healing with herbs. The site can be a bit difficult to navigate, but it offers a wealth of information particularly on Women’s Health. United Plant Savers – www.unitedplantsavers.org – a nonprofit organization founded by Rosemary Gladstar that is dedicated to protecting the world’s medicinal plants. “WHO guidelines for assessing quality of herbal medicines with reference to contaminants and residues” – http://apps.who.int/iris/handle/10665/43510 – a PDF from the World Health Organization. Mountain Rose Herbs – www.mountainroseherbs.com – a reputable sources for bulk organic herbs and spices, essential oils and teas. Silver Mood Herbals – www.silvermoonherbals.com/smhinfo.html – site includes an overview on specific herbs, along with herbal lotions and sprays available for purchase online and in stores in Connecticut. Twisted Roots Botanicals – http://twistedrootsbotanicals.com – homemade herbal products from Kim Bartell and her husband Dan of Rhode Island. *Editors Note: Kim and I were Girl Scouts together so I can attest that she is honest and ethical! Blumenthal, M. Chapter 6: Issues Concerning the Safety of Herbs and Phytochemical Preparations in Integrative Medicine. McGraw Hill Companies. Lee, R. (2004). Chapter 5: Botanical Medicine: Overview in Integrative Medicine. McGraw Hill Companies.